Natural resources are gifts of nature; they are present without human intervention. 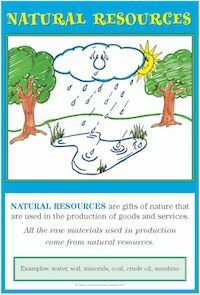 Natural resources are used to produce goods and services. Traditionally, in economics the term land has been used (and is still often used) to mean natural resources. All raw materials that are used in production have their origin in natural resources. However, this creates some confusion when classifying resources. For example, is the cloth used to produce blue jeans a natural resource? Economists technically would classify this cloth as a capital resource because it is actually an intermediate good, not one that comes directly from nature. Natural resources are necessary for production. No matter how much one wants to care for the environment, it will be necessary to disturb the environment to some degree in order to produce the goods and services society desires. This results in some inevitable tension regarding the proper use of the environment. Use modeling clay to create examples of natural resources used in production. Create a bulletin board entitled "Natural Resources We Use in Production." List or draw pictures of natural resources that go into the production of different goods and services. List or draw pictures of natural resources that are mined. Make a collage showing natural resources of your state, region, or community. Write a paragraph entitled, "Why Natural Resources are Needed To Produce Goods and Services." Read a story to your students. As you are reading, have individual students write down natural resources mentioned in the story. Discuss student responses.